Hum of Our Blood peels back time to the dawning days of the AIDS pandemic when the world seemed to be standing at the edge of a foreboding precipice. In an exploration that is both personal and universal, Garner’s poems expose the best and worst of humanity at times of peril. With language that cuts straight to the nature of grief as the author watches her beloved son’s body dying, Hum of Our Blood also stands as a love song to those, then or now, who would embrace one another despite what smolders in the blood: those who come to understand that death, no matter the reason, has its own rhythm, and grief, even at its darkest, instinctively moves toward light. 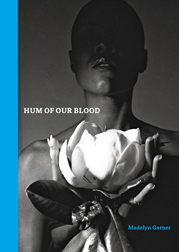 This collection does more than recall the HIV epidemic as chronicled by the loss of a loved son; it offers juxtapositions between the beauty of the body and its annihilation, and between beauty rendered to the world and the loss of its agent. Amidst searing details of the slow rampage caused by disease, Hum of Our Blood nevertheless is full of a fiercer and more compelling light as it depicts a talented, passionate young artist forced to face his death as openly as he embraced the colors, textures, and the sensual pleasures of his life. And with a mother’s love, the author bears witness every step of the way, with an open heart and skilled restraint, to produce these powerful, exquisitely rendered poems. In poem after stunning poem, Madelyn Garner’s Hum of Our Blood elegizes the son she knew and loved in all his human dimensions, speaking into those spaces usually left silent between mothers and sons. In a book of truth and life as much as it is about AIDS and death, Garner sheds lights both warm and bright on the darkest corners of gay existence in the l980s and 90s from a perspective continually surprising and, as strange as it may seem, delightful. 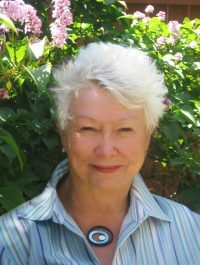 Master teacher, editor, and poet, Madelyn Garner has degrees from the University of Denver and Mills College. As a creative writing instructor, middle school principal, and mentor, she is widely recognized for designing and implementing a variety of innovative educational programs at all levels, elementary through university. Among her educational achievements and honors, she is the recipient of the Colorado Governor’s Award for Excellence in the Arts and Humanities for encouraging incorporation of the arts into school programs and her leadership in providing students multiple opportunities in the field of writing. Named a Leo Love Merit Scholar at the Taos Summer Writers’ Conference, Madelyn also was awarded an Aspen Writers’ Foundation’s Annual Writing Retreat scholarship. In 2010, she won the Jackson Hole Writers Conference Poetry Prize. As co-editor, she edited and published the anthology, Collecting Life: Poets on Objects Known and Imagined, in 2011. Over the years, Madelyn has been a featured poet at numerous readings as well as collaborative ekphrasis events held throughout the United States. Recent work has appeared in The Best American Poetry, 2015, The Florida Review, The Pinch, Slant, Roanoke Review, Nimrod International Journal, The Journal of Feminist Studies in Religion, and Water-Stone Review, among others. She lives in Denver, Colorado, along with her children and grandchildren.